This is a yummy little side salad, perfect to eat on a slice of baguette or piece of toast. 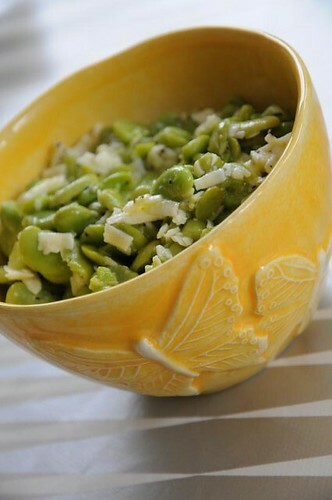 I urge you to try it, because although broad beans are a bit of a hassle to peel, this flavor combination is well worth it. A bonus - Dante, age 1, loved this. Tip the beans into some boiling water and cook for about 3-5 minutes. (Mine were frozen and needed 5.) Drain and splash with cold water to cool them down. When cool enough to handle, peel of their tough skins, and save all the little green kidney-shaped beans in a bowl. Add the cheese, olive oil (start with the smaller amount), lemon juice and a good grind of black pepper. Taste to see if you want a bit more oil, lemon, cheese or perhaps salt. Oh I can't wait to try this when the broad beans come in season next year - they are one of my favourite vegetables! It is a bit of a drag 'peeling' them but well worth it in the end! I'm thinking I might buy some frozen broad beans soon just to try this because I may not be able to wait till next year! Wonderful salad, i love Broad Beans. I have a cooking blog, if you want to visit, i will be happy..
YUM! I love broadbeans so will defo try this. Thanks for the inspiration.